Despite what you may gather from many of my posts about Moodle superiority in the LMS market, I do learn and try to play nice with other systems. Because I'm primarily concerned with sharing high quality content I thought I'd share this with anyone outside of the Minnesota Partnership for Collaborative Curriculum. To the end user it looks like text on the page in the LMS. When I back up the course and restore it into another LMS we don't have to worry about any of the content not coming over (stick to Pages, Assignments, Forums and Quizzes). Some LMS allow Moodle backup files (Canvas, Schoology), some will need the IMSCC backup files. Either way, any edits to the content made in Drive automatically populate in all copies of the course that exist. If a user wants to make any changes they simply duplicate the page and do with it what they'd like. It does not affect the original. It works pretty well for most of our purposes. I'd still rather everything be in Moodle to take advantage of things like the Lesson module, auto-linking, Glossaries and completion tracking, but some people made a decision to go with something with less features and this process accommodates those platforms. In another post I can share why I still think that this same instructional content would be far superior if it is completely self-contained in a Moodle environment. We're currently working with over 180 school districts in the state and this is what has worked best so far. Apparently some LMS out there is touting their ability to handle Standards Based Grading and some people were asking me about doing that in Moodle. Just to be clear, I don't actually have my courses set up for that so what I'm about to share is a demo version of what I would start with and some suggestions I have for those who wish to accomplish the task. So take what's useful and abandon the rest. First, you'll want the site admin to enable Outcomes this is really at the heart of being able to achieve this practice. Then you have a few decisions to make. I'm guessing that other systems will pre-load things like Common Core standards or even standards for your state into your system, this method requires a little more DIY. Moodle does allow for a bulk upload of outcomes but it works a little differently than the files I've used for bulk user upload/enrollments. Technical side note: the way I made it work was to upload my outcomes to a spreadsheet in LibreOffice and when I went to save it as a CSV file I selected Edit Filter Settings and set Character to Unicode (UTF-8), the Field delimiter as a semicolon and the Text delimiter as a quotation mark. I mention this because previously for uploading CSV files to Moodle I just used a Google Sheets template and downloaded CSV. This one didn't work the same way and this was how I made the upload work. I mentioned a choice to make...You'll have to decide if you want your outcomes to be made available site wide or just in the course itself. That's likely a discussion for your curriculum directors or department chairs. I would probably make the CSV file available for that subject area to those teachers so they can upload them to their own courses and select the ones that are applicable. I mention this because making all subject area benchmarks available site wide could be messy if there is a lot of scrolling. I would also suggest sharing those templates across districts so others don't have to duplicate the work of putting all of the standards together. Second, in the Moodle gradebook I would create a category for particular standards clusters. For instance, in English/Language Arts the first three benchmarks fall into the category Key Ideas & Details. I created a category in my course called, Key Ideas & Details. In the assignment settings for all of the summative assignments that measure student mastery of that area I can tag each outcome that I uploaded to the site. Third, when grading the summative assessments you can assign a value not just to the overall assignment using a scale or points, but also to the individual standards being assessed. First you have to go into your assignment settings and select which outcomes you want to measure in the assessment. Since this is an example, I've only uploaded three and not all of the ELA Standards addressed in the course. Once you save those assignment settings you will see a separate item in your gradebook for each benchmark. Since all of these are from the same cluster I moved them all into the Key Ideas & Details category. Some other decisions will have to be made about what should appear in the aggregation for course totals and what items should be visible to students. If it were my course I would probably have all formative assessments visible to students but have the grades weighted as zero. 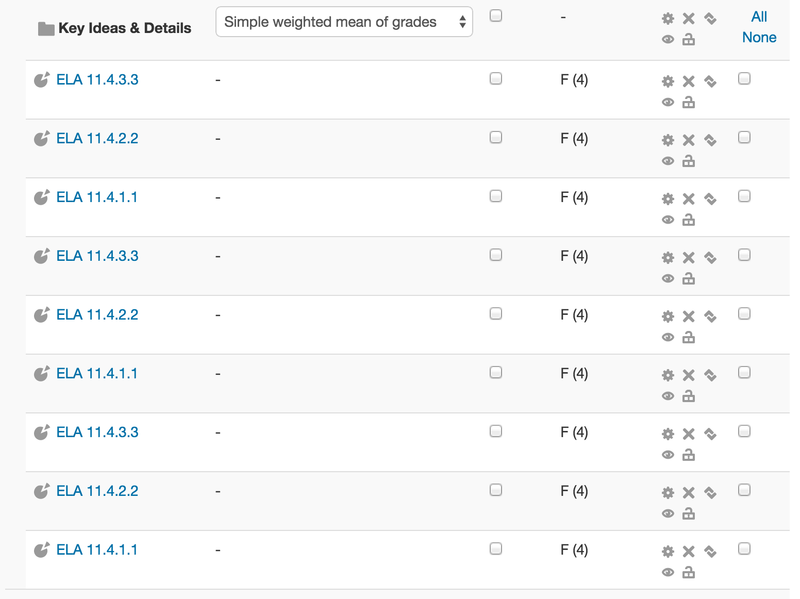 I might also only set each benchmark to appear in the course once for my SBG documentation, otherwise things could get long, but you can minimize categories in the gradebook view. At this point, I think I just might be scratching the surface for what is possible here and I would welcome the chance to discuss this in further detail with an expert in Standards Based Grading. My biggest objective with this post is to assure people that it is indeed possible using Moodle. It is and you have options. There is more research every year about the importance of feedback; making it instant, providing it often, allowing for more than just data on if a response is right or wrong. We have the tools to integrate these kinds of responses into just about every system. I'm way into the idea that frequent quizzing interrupts forgetting. If a student does something in a course it generates data; as a teacher you should be able to view/analyze and use that data to target improvements to your curriculum. Students should also be able to see how this data relates to their overall progress in a course. These kinds of features should be automated and provided in real-time. Sadly, these kinds of detailed analytics are not readily available in all systems. After having spent a few months immersed in multiple learning management systems it seems that open source wins out again. The detailed reports and progress indicators that students receive and that teachers can view in Moodle are essential to any personalized learning initiative. It sounds silly, but even the illusion of progress can greatly increase the chances of a person actually completing a task and even the speed at which they work toward their goal. Building those into curriculum is going to be key to student success and likely even being able to cover much more content in a given timeframe than might otherwise have been possible with traditional tools in traditional settings. Feedback must be provided frequently so that there is time for adjustments to be made before it is too late. Here's how I build these elements into a Moodle course. 2: Quizzes - Providing quizzes is nothing new, but the use for them now has less to do with an academic grade than it does as an important tool for presenting content. For instance, in a traditional model a quiz might be used to see what a student knows at the end of a lesson and then that score is entered in the gradebook and the course moves on. If you didn't get a chance to click on the first link in this post here it is again. Providing frequent, multiple choice assessments in courses that build on previous units is a proven way to get students to remember course content. Building in the review options that Moodle allows for is an important part of this. They don't just see that they got an answer correct or incorrect, they see detailed feedback based on the response. If it's an incorrect answer they are directed to the information they should have learned and if they answer correctly it is an opportunity for the feedback to reinforce that knowledge. The quiz has built in progress indicators in a side block as users work through the questions. 3. Lesson Modules - This is one of the most dynamic Moodle elements because it allows for a personalized pathway through content with questions that can direct learners to content based on their responses and interactions with the material. They take some time to set up but they are exactly the kind of feedback loops that learners expect when using digital curriculum. With the setting to include it in the gradebook or not they become flexible resources that allow for practice opportunities while still providing data back to the learner. They include progress bars which, as stated previously, is essential to completion. These modules have become my preferred activity in courses I now design. 4. The Checklist Module - While not technically part of Moodle, one of the strengths of the system is that it allows for so many wonderful plug-ins. 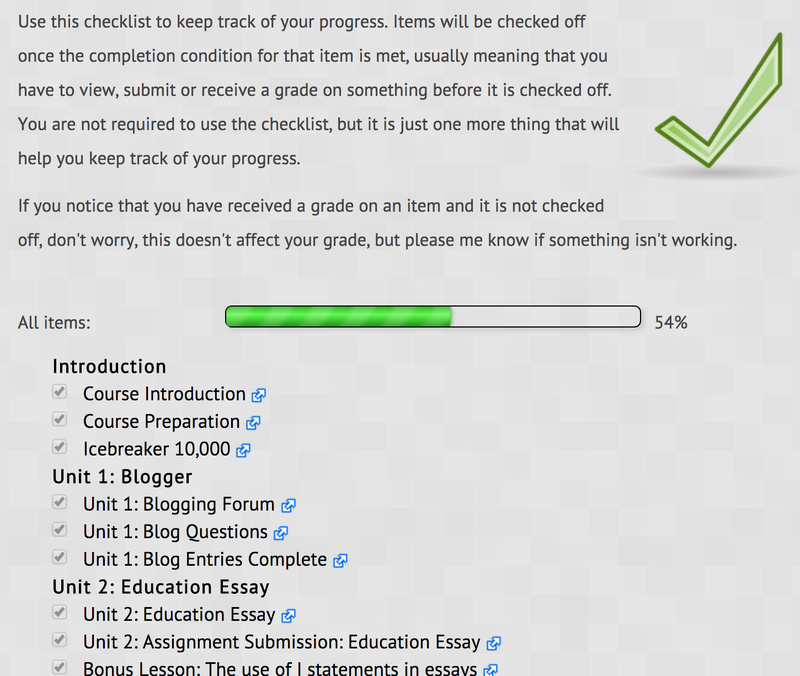 The Checklist module allows for real-time data on completion of activities with the addition of a progress block so that students always see how much of a course has been completed. The developer/maintainer, Davo Smith is incredibly responsive to user needs and makes frequent updates to the tool. All of these tools and indicators help support student working through course content in ways that exceed what a teacher can provide for individuals in a course without the use of digital curriculum. These tools go beyond content and make the use of a Learning Management System (LMS) (particularly Moodle) an essential component to learning (On a side note, it's why I don't consider Google Classroom to be an LMS). I can use that completion data to identify which students have completed the content and which students are falling behind. I can identify elements of my course that are being under-utilized and make them more compelling resources to access. I can use course completion block reports to quickly identify how many users in a course have completed the requirements (I rely on this heavily for professional development courses in my district in which we have over 800 users enrolled in a section). User Reports offer me data on who accesses materials when to help identify support requests where users report little information that helps me diagnose their issue. Following up on when they accessed materials and filled out a support request often leads me to the resource with which they need support. Quiz and Lesson statistics provide additional information down to the activity level that can help me make judgements about the effectiveness of my curriculum and questions. Looking ahead, I was pleased to see just how seriously Moodle developers took the community feedback on their Grade Reports. I tested the features of the Moodle 2.8 gradebook today on a development site and was impressed with the types of information that can show students even how much a single activity in a course is worth in relation to others and how much of the course total it's worth. tl;dr? If you do something, you should see something that indicates what you did and you should see it right away. Here's my report of what I found when trying to restore a course from 2.6 to a 2.5 site yesterday along with my work-around to actually force it to happen and a Moodle developer's response. Lest anyone think I'm blind to anything dysfunctional in Moodle, this is a prime example of developers ignoring various types of use within a classroom or institution. In a move to leap frog their competition, Moodle has been on a fairly aggressive update schedule for the last couple of years. While these updates have brought many new features and improvements, there are ways that this can actually hinder districts who wish to collaborate. I understand that moving backups of courses from version 2 to version 1 would be problematic. There is so much that is completely different. Moodle's official stance is that they will not support the transfer of backups from any version to a lower version. While this really hasn't been an issue as it was easy enough to import a 2.5 course to a 2.4, 2.3 or even 2.2 site before, this is no longer the case with Moodle 2.6. A backup made on a 2.6 site does not even restore on a 2.5 site, which is only 6 months behind the new version's release. Seriously? Most districts only update once a year, some once every two or three years. This is because the IT departments in many districts have little, if anything to do with curriculum groups or teaching and learning departments. Some districts pay a vendor to host Moodle for them and updates are usually scheduled for the summer. This prevents those districts from using courses shared with districts using a newer version. I'm working on a project that is facilitating the creation of 40 core, year-long courses from grades 3-12 for Minnesota districts that will eventually become Creative Commons licensed. Does all of that development really need to happen on a site with a version of Moodle that is no longer supported just so that we can make sure that everyone is able to use the course backups? Is it really too much to expect that a file from versions six months apart really cannot work together any longer?! Now for Schoology, I've been hearing rumblings of dissatisfaction with Schoology since they've limited what is possible with their "free" version. Districts are not back in the hunt for a solution and it seems looking to switch back to Moodle. I was just at a conference where someone was showing off her Schoology course as an example of a course that aligns with a Quality Matters rubric. It was ugly to navigate and to look at, but let's say I wanted a copy of her course, how would I get one? Can she back it up into a backup file and share it with me? No. It would appear that the only way to transfer courses between districts would be to create a shared public resource and then import it into a new course. This import does not include assessments like quizzes. This type of sharing isn't always possible, desired or legal. The other move Schoology made this week that raised my eyebrow was that they are now requiring users to verify their accounts. This isn't just a link in an email you click on. They actually wanted me to upload a signed teacher consent form and a scan of my school ID or driver's license. That's not going to happen. So ends my work to transfer shared courses into the Schoology platform for districts who aren't able to complete that process on their own for whatever reason. On a side note, I've been at a few conferences since my last post and the first thing I've still been hearing from vendors and users of Schoology alike when they describe the product, "It's a lot like Facebook." Might be time to change the company line on that. It doesn't have quite the same punch as it used to. All content unless otherwise noted copyright of Jon Fila. Awesome Inc. theme. Powered by Blogger.